After the successful women's march in Washington, D.C., in January, the same group that organized that rally is spearheading another event: A Day Without Women. 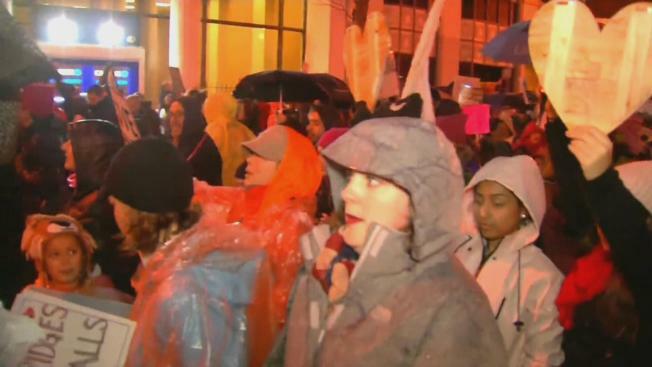 Rallies are planned across the Bay Area and the country for Wednesday to show the impact of women. Organizers say women control a vast majority of consumer spending and an increasing percentage of the workforce. They hope to show what it would be like to have a day without a woman. The owners St. Lightning, a clothing boutique on Polk Street in San Francisco, cannot afford to attend Wednesday's rally in the city. But they will do what they can. "We're going to remain open because we are a small business, and we also represent a lot of women artists," shop owner Jenni Witt said. "We will be donating 20 percent of our proceeds to Planned Parenthood." Rally spokeswoman Martha Shaughnessy said however many attend the rally, it serves a purpose. "We want to show up and see what the world would look like without us there, in both our working contributions and spending power," she said. San Francisco Supervisor Katy Tang will be one of the featured speakers at the rally. "I think there are very many strong male allies, and they understand it, but just collectively the sheer volume can send a strong message," Tang said. Critics say only women of means can afford to leave work to be at the rally, and some women just don't support it. "I just don't feel that much of a rapport or support for that," San Francisco resident Jennifer Gibson said. Google employee Bridget Chang said the tech giant is making it easy to attend. "We're going to plan to do it as a company," she said. At Buffalo Theory Bar and Restaurant on Polk Street, women employees there said they just can't afford to lose a day's pay. But if they change their minds, they'll have the owner's blessing. "We want to support our employees, and anything to support women's rights we definitely want to help support," restaurant owner Gil Hoh said. Organizers are not putting a number on the crowd expected. They say those who can't come but want to show support should wear red Wednesday.